Kids swag style outfits. We all know how parents like to experiment with dressing up their toddlers, but it is no longer passable to dress up your kids in frumpy and dowdy outfits. 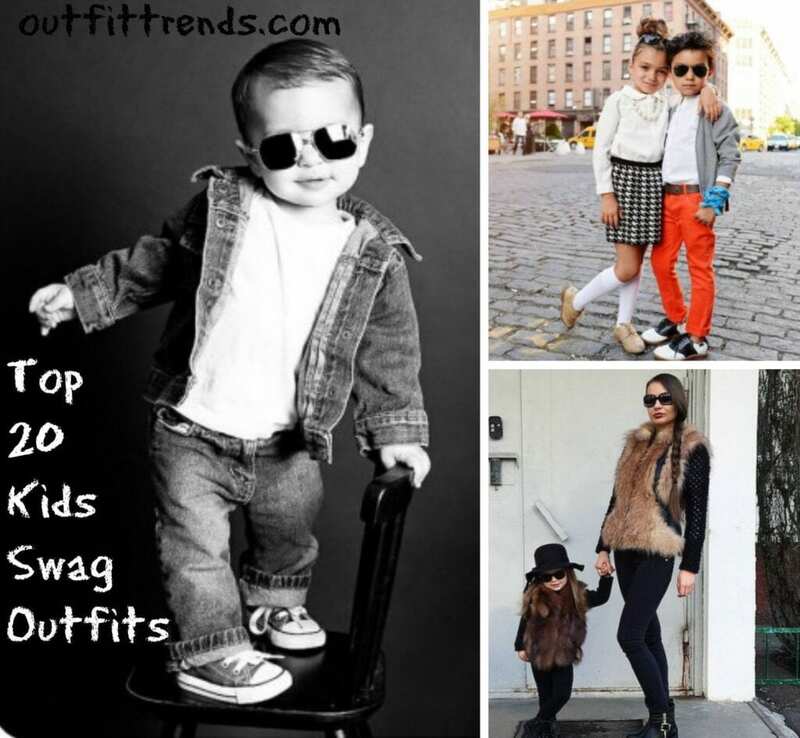 Nowadays, kids are becoming trendsetters and taking over the fashion world by storm with their swag style and cool outfits! These fashionable tots are simply irresistible with their impeccable outfits and charming attitudes, which are too adorable for words. A large number of blogs on Tumblr and Pinterest, as well as independent websites, are dedicated to showcasing kids fashion. What sets these mini fashionistas apart from others is that they are not afraid to pose in front of professional cameras, even in surroundings such as urban scenery. Remember how awkward we used to feel in our childhoods when someone would take our photo? 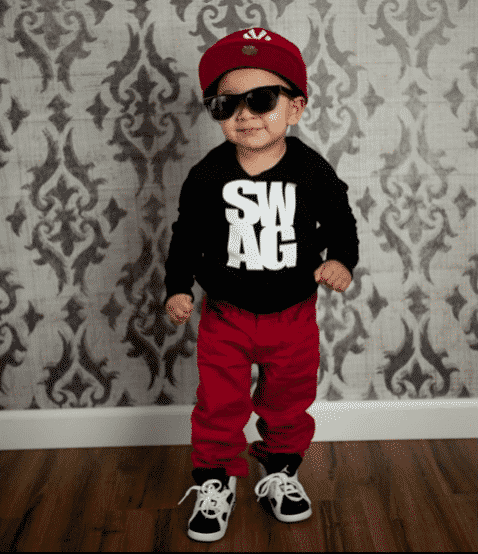 Undoubtedly, whether they are naturally talented at throwing together such awesome outfits, or get dressed by their chic parents, these kids are redefining the word “swag”. Feeling inspired? Here are our top picks of kids who we think have the best swag outfits. This assemble just shouts ‘Swag’ with its minimal yet tasteful outfit. It doesn’t get simpler than wearing a t-shirt with the word SWAG printed on it! A combination of dressy and casual, this outfit, combined with a high ponytail, a mini designer LV handbag, and Aviators shades, looks effortlessly chic and stylish. Because childhood is so temporary, it’s important for kids to have fun while donning their cool outfits. A simple hoodie with colorful, whimsical pieces is a good way to foster individuality. Just look at how cool the fringe looks on that hoodie! Naughty or nice? This refreshing outfit features a leather jacket and cheetah print to channel the inner bad girl, paired with a flowy peach princess skirt, giving the best of both worlds and looking like a street style princess. This kid has nailed the formal look without appearing stiff and looks totally dapper! Donning outfits and doing fun activities before they became cool. These duds are perfect for the sporty kid who wants to be the best dressed kid in the playground. A classic blue shirt peppered with plaid, and beige trousers. But what’s missing? Oh yes a hat! This baby is rocking the bow-tie like a boss! And it contrasts beautifully with the plaid shirt! All of us owned these sweaters in our childhood. AKA Ugly sweaters. Just goes to show that you can always make a good outfit with whatever clothing you already own, if you do it right! Avril Lavigne will give this skater boy a chance for sure! A classic assemble which is reminiscent to the style of Audrey Hepburn. A maxi skirt paired with the right accessories make this little diva exceptionally swagger! These mixed and matched outfits are simply too cool for school! Layers of denim done right by this cool kid! A pair of converse shoes is all you need to transform your outfit and look as cool as this little one. No better way to stay warm and toasty than layers of fur! The Quintessential cool white girl outfit. All that’s missing is a Starbucks cup!